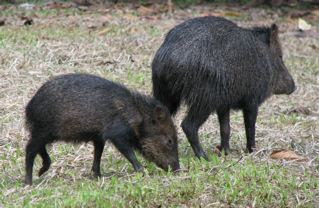 One of my first nighttime discoveries, during my visit to La Selva Reserve in Costa Rica, was the Collared Peccary. On my first day I was returning from the dining hall in the dark and heard something rooting around beside the path to my cabin. My flashlight revealed a group of peccaries rooting around the tree outside my building. 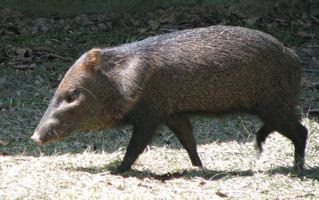 Collared Peccaries (Tayassu tajacu) are small to medium-sized hog-like animals covered with gray or blackish long coarse hair. Their weight ranges from 35-65 pounds (17-30 kg). They have slender legs, short tails, large heads, and small ears. This species is identifiable by a band of lighter-colored hair at the neck that furnishes their name because it looks like a loose collar. 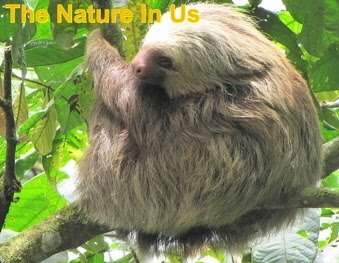 They are found in rainforests, deciduous forests, and even agricultural areas where they raid crops. During dry seasons, as is Costa Rica this time of year, they gather in large numbers by lakes and streams. The Rio Puerto Viejo runs behind my building. They travel single file along forest paths, so when you see one come out of the forest to graze, you can begin counting. 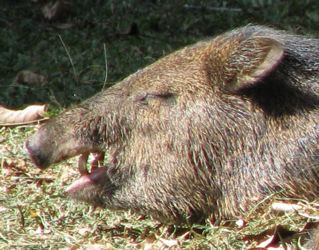 Peccary have reputations for aggressiveness toward humans, but experts agree it is exaggerated. I have followed them and they prefer to flea, but if surprised or cornered, the herd could panic and charge. Normally, they travel in small groups of 3-25, mostly 6-9. The most I've seen at one time is 19 scattered around the front of my cabin area where there are trees producing some good food selections at this time. They are omnivores, mainly digging into the ground with their snouts and rooting for vegetation. They feed on roots, underground stems, bulbs, leaves, fruit, insects, and even small vertebrates that they stumble across. I have come to realize that the sound of a dog barking that I've heard is their vocalizations for when they're not going to share something they discovered. One of the larger of the group grabs it, barks and threatens and picks it up and carries it along to eat elsewhere. Having a big mouth comes in handy at times like these. A long line forms behind that discoverer hoping there will be something left over. 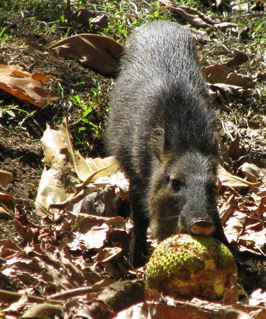 This rather small peccary wondered off alone and found a large fruit to enjoy all by himself. Although his mouth wasn't quite large enough to enjoy it quickly, he entertained me for a very long time. I was surprised none of his group came to share. Video of the show at the bottom of this article. They have enlarged, sharp, pointed, tusk-like canine teeth. When these disagreements are going on, you don't want to be too bold on approaching. They don't need any more competition and will defend their territory. One of the gentleman birders I've spoken with a few times here found two fighting over a meal and went closer to get a picture. One of them thought he was inviting himself to dinner and began to charge him. He backed up quickly and the peccary backed down. They have poor vision, but great hearing, so being quiet might keep them off guard. Pigs and hogs are often talked about as dirty animals, but I've found that when given enough space (like in the wild or large pasture, not a barnyard) they are very clean. I've seen several of them cleaning each other as this scene shows. They do like to wallow in mud and shallow water and will have a spot within their home range to do so. It may be another reason they enjoy my cabin area since the riverbank is right behind it. But like young boys, they look good when they clean up, and sometimes Mom has to lend a helping hand (or tongue). Mating season is year round and females give birth to 1 or 2 young that are born 4-5 months after mating. The young can walk and follow the mother after a few days of birth. There have been some young ones of different sizes in the group around the cabin. Actually, they're beginning to feel like family since they hang around so much. I have this urge to say, "Hola! Como estas?" when I return to my room and find them grazing. Peccaries are known to have a powerful musk gland on the top of their rump. Although what I've read says their odor is always obvious and that you may smell them before you see them, I have not found any offensive odor with the daily encounters I've had. Lifespan is about 10 years in the wild. Their native range extends northward into the USA to the states of Texas, New Mexico and Arizona where they are known simply as Peccary or Javelina. They are called Javelina (Spanish for javelin or spear) because of their razor-sharp teeth. View my Costa Rica photo albums.